Suppose we are sampling instantaneous power readings at regular intervals and energy consumption over each interval of a household's aggregate load. Let the two power readings at t1 and t0 be p1 and p0 respectively. Let the energy readings at t1 and t0 be e1 and e0 respectively. These values are marked on the graph below. Since the area under the graph represents energy consumed, e_aggregate is represented by the combined blue and red areas. Using these readings, we can accurately calculate the time instant at which the appliance changed state, tx. 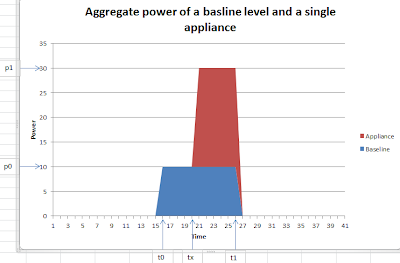 Let e_baseline and e_appliance be the energy consumed by the baseline appliances and the appliance of interest respectively. The only unknown is tx, allowing us to calculate its value by rearranging this equation.